How does a man come back from the brink? Billionaire Lincoln Montgomery, a Nobel-Prize-winning doctor, nearly lost himself after the death of his wife and unborn child. Now, years later, he wants nothing more than to find a woman to share his life with, but doesn’t believe true love can come around twice in a lifetime. A single tee shot and a glimpse of perfection changes his life forever by sending him just the woman to help heal his soul. Secrets that have been buried for fourteen years and a deeply scarred soul have prevented Dr. Nicole Harris from finding true love. A beautiful woman who only sees herself as average, she perceives herself as someone whom nobody would want but seeks to atone for the consequences of her decisions. Then a chance encounter brings Lincoln Montgomery into her world. Fearful that the man she’s fallen in love with will discard her if he ever learns the truth, she vows to keep her secrets buried. But what happens when the love of two lifetimes is confronted with the dark secrets that could destroy them both? Can Lincoln and Nicole both survive their pasts and forge a future together, or will one final secret destroy their love for good? Molly: What music, if any do you listen to when you write? BK: I like classical typically Gustav Mahler or Tchaikovsky. I also listen to country depending on the story. Broadway showtunes or theatrical soundtracks may also be heard. Molly: Are you a full time writer, or part time writer? Part-time. BK: Full-time doctor. Currently I work 9-6 or later seeing patients, spend a few hours with the family and retire to the cigar shop where I can write and smoke cigars after everyone leaves. I typically write from 11-1:30 everyday. Sometimes a little earlier and rarely later since I have to go to work. Molly: Do you hope to one day be a full time writer? BK: I would like to think that I could one day be a full time writer, but I’m not sure if it will ever happen. I have been able to refine my craft so that I am writing more daily and producing more material. Molly: Do you have a word count per day you try to hit? BK: 2500-3000 when I’m not reading books. I have read 220 books since January 1st of this year. Molly: When you finish writing a book, how long before you begin writing the next one? BK: That is an interesting question. I’m currently working three projects. The follow-up to book 1 called A Heart in Remission, which is written but in the first editing stages, I’m currently 53K words into book 3 of the series A Heart Reborn and I completed a novella that I’m currently waiting to get back from the editor for a Kindle World series for Sapphire Falls by Erin Nichols. It took 4 years from beginning the first book to publishing. I have written almost two full length novels and a novella in the last year. Looking into his eyes, Nicole was intrigued by what she saw and felt. It was as if the sky had cleared, the sun was shining and she felt the refreshing breeze after a spring rain hit her all at once. But, she could see something else in his eyes that gave her pause. She could see a lingering deep despair that made her want to take him in her arms and tell him it would be okay. At 5’ 8” with dark blond hair and brown eyes, she had always been a tomboy at heart and much preferred playing games outdoors to sitting inside and reading. She had never really considered herself a beautiful woman just merely average but she had never been swept off her feet or stopped dead in her tracks by meeting a man until now. Her athletic grace seemed to elude her anytime she saw something she may be interested in. Today had caught her by surprise. She did not see this tall stranger until it was too late and she was bumping into him with full force running to get something for her mother. Right now she was thanking God that she needed more ketchup for her fries. “It is a pleasure to meet you Dr. Montgomery” she said with a smile and warm tender eyes. Nicole had been alone too long. Yes she dated in recent years but it never lasted. She was looking for the one Mr. Right not Mr. Right now. She had always had a notion that romantic love, love at first sight was out there waiting for her and she would not settle for anything less. However, today she could not help feeling that maybe she had finally found her tall prince charming. “So, did you go to school here?” she asked. “No I am a proud graduate of the University of Georgia.” Lincoln said. “Eww.” Nicole said with a chuckle. “So what brings you to Auburn? Slumming it with other schools?” She said mockingly. “Well then”, she said “you want to avoid that group over there. They only care about your bank account and whether or not they can get into it.” She said pointing at a group of women standing on the far side of the room. Lincoln laughed hard for what seemed like the first time in 3 years. He was suddenly feeling light on his feet as if the burden was being lifted. “Well unless you were out at the Grand National yesterday then it was not this weekend.” Nicole said. Unsure what to do, Lincoln held out his hand to Nicole but was surprised when she pulled him in for a quick hug. “Just as good as I thought it would be Dr. Montgomery.” Nicole said with a slight flirtiness in her voice. After their too brief hug, Lincoln stood there staring at Nicole momentarily shocked by her display of affection, he could do nothing more than smile at her and bid her goodbye. Lincoln was so excited he could not stand it. Rob saw Lincoln and turned to Erin to point out the look on his face and eyes. “I don’t know what just happened” he said “but I don’t think I have seen him like this in years.” Rob laughed as he watched Lincoln walk towards them with an almost swagger in his step. He was shocked by the change of his demeanor today. Gone was the dark brooding Lincoln replaced by the man he knew so many years ago. Not sure what to make of what had just happened he was silent while he waited for Lincoln to tell him about the encounter. BK Harrell is former Navy physician who has had a long love of writing. He specializes in medical, military and sports romance writing. He began seriously writing while deployed to Afghanistan in 2012 and has never looked back. Whether he is teaching, serving his country, educating people about the fine art of cigars, practicing medicine or spending time with friends and family he uses his diverse background to shape the world around him through words. 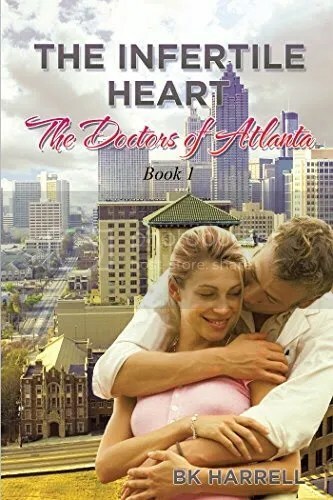 This entry was posted in Interview and tagged Author: BK Harrell, Contemporary, M/F, Profession: Doctor, Second Chance At Love. Bookmark the permalink.